Iran is working to send a man into space within the next five years as part of its contested rocket launching program that is widely believed by the United States and other governments to be a cover for the Islamic Republic's work on advanced intercontinental ballistic missiles capable of carrying nuclear weapons. Iran first launched a satellite into space in 2009, and since the signing of the landmark nuclear deal that freed up billions in cash windfalls, it has continued to work on advanced rocket systems that are very similarly related to ICBM technology, which could carry a nuclear weapon. A recent report on Iran's space program carried by one of the country's state news channels disclosed this month that Tehran now has a new goal: To launch a man into space within the next five years. 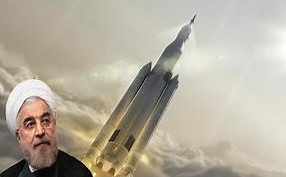 "In the framework of a five-year plan, we intend to launch a man into space on our own, in order to become one of the aerospace industry powers," the news report stated, according to a translationprovided by the Middle East Media Research Institute. "We hope to see that day." However, the U.S. diplomatic and national security class has accused Iran of using its space program as a cover to test-fire advance ballistic missile technology such as that needed to launch a nuclear weapon long distances. Secretary Mike Pompeo, discussing Iran's tests earlier this month in response to questions from the Washington Free Beacon, said the country's space program is providing Iran with critical know-how about ICBMs. "You'll see in a handful of days the Iranians intend to launch a space launch vehicle," Pompeo told the Free Beacon in Abu Dhabi during a trip across the region. "The claim is that it is to put some satellites in the air. The truth is this will be another step in their understanding of how it is you can launch an ICBM." "The whole world needs to come together to oppose that," Pompeo adding, stating that such tests violate U.N. Security Council Resolution 2231, which calls upon Iran to stop its ongoing tests of various types of advanced ballistic missiles. Meanwhile, Iranian officials said on Tuesday that it has the technology and know-how to increase the distance of its ballistic missiles, information likely gleaned from multiple space launches. "Iran has no scientific or operational restriction for increasing the range of its military missiles, but based on its defensive doctrine, it is continuously working on increasing the precision of the missiles," Ali Shamkhani, a confidant of Iran's Supreme Leader Ayatollah Ali Khamenei, was quoted as sayingby state-controlled broadcaster IRIB. Iranian officials say the missile program is off-limits in any talks surrounding its contested military nuclear program. Additionally, the country confirmed Hezbollah and other groups possess such missile technology and are prepared to launch them from locations in Lebanon and the Gaza Strip. Iran has attempted to launch monkeys into high-orbit in the past with middling success. However, a new class of rockets—very similar in nature to offensive ICBM weaponry—promises to help Iran advance its contested space program. "Currently, we have prepared other satellites for launch," the report states. "The Toulou satellite [is designed] for distant measurements. The Nahid satellite [is designed] to test the opening of solar panels [on satellites] and [for] the sending and receiving of images. The Zafar satellite [is designed] for tri-spectral photography. The Sharif, Ghaem, and Paris satellites have visible-spectrum and infrared cameras. The IranSat-1 communications satellite [is designed] to test systems for the withstanding of cosmic radiation." Iran admitted in the report that it had used technology obtained from scientists who have been killed due to their ties to Tehran's illicit ICBM and nuclear program. "We built the Navid and Simorgh carrier rockets, which were more advanced," the report disclosed. "The former reached speeds of approximately 28,000 km/h and the latter was even faster. They also carried heavier satellites. Eventually, we designed the Ghaem carrier rocket. This Ghaem rocket was a project of the martyr Tehrani Moghaddam and it had a four-stage engine. Only a few countries possess this technology." Iran is believed to have one of the largest stockpiles of ballistic missiles in the region, including ones capable of reaching Israel and part of Europe. It also has shared this technology with regional terrorist groups, including Hezbollah, Haman, and other militants. "We wanted to test the space outside of our atmosphere with the probes," the report added, discussing the many stages of Iran's space launches in past years. "Therefore, we launched Probe 3 into space. It carried a capsule that contained a mouse, two turtles, a few worms, and human cells. This launch cost 3 billion toman [~1.5 million USD]. This was the first time that we managed to launch living creatures into space."